Heads-up Match-heads! Firestorm will be featured in an upcoming issue of BACK ISSUE MAGAZINE! On sale May 8, 2019! Included are interviews with Firestorm writers and artists: Gerry Conway, Pat Broderick, Rafael Kayanan, and John Ostrander! Can’t wait to read this!! Hunker down in your fallout shelter with Back Issue #112’s explosive “Nuclear Issue,” starring the Fury of Firestorm! Also: Dr. Manhattan, a DAVE GIBBONS Marvel UK Hulk interview, villain histories of Radioactive Man and Microwave Man, Bongo’s Radioactive Man and Fallout Boy, and the one-shot wonder, Holo-Man! With CARY BATES, PAT BRODERICK, GERRY CONWAY, STEVE ENGLEHART, RAFAEL KAYANAN, BILL MORRISON, FABIAN NICIEZA, JOHN OSTRANDER, ROY THOMAS, and more! 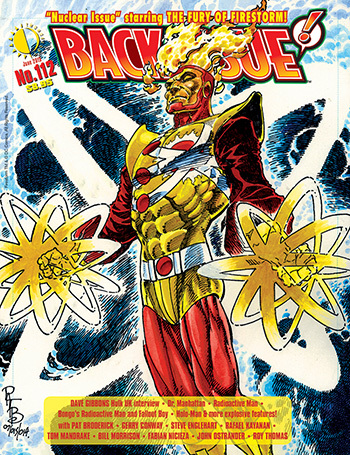 Featuring a Firestorm cover by Pat Broderick. Edited by MICHAEL EURY. Be sure to pre-order your copy from your local comic shop today! Posted in: Gerry Conway, John Ostrander, Pat Broderick, Rafael Kayanan.